With just half a month to go before I leave Japan and the JET Program, I’ve been really busy and my blog has languished as a result. I’ll probably finish writing about my China travels after I’ve returned to the US, but I’ll try to squeeze in some posts before I leave. Yesterday, packing be damned, I went to Kyoto. Last Christmas, I was given an excellent book called Old Kyoto, which details traditional shops, restaurants, and inns in the former capital. I haven’t had many chances to get over to Kyoto since then, so I made time this weekend and visited a few places from the book. I got a late start – partly due to a farewell party the night before and partly because I had to do some laundry – so my first stop in Kyoto was for lunch. I ate at Minokō, a cha-kaiseki restaurant in the Gion district. 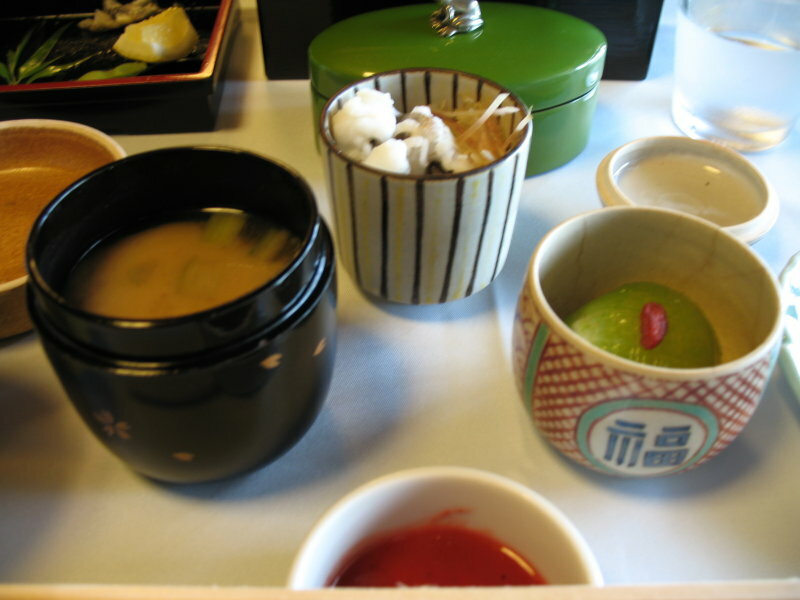 Cha-kaiseki is a sort of haute cuisine served to accompany a tea ceremony. 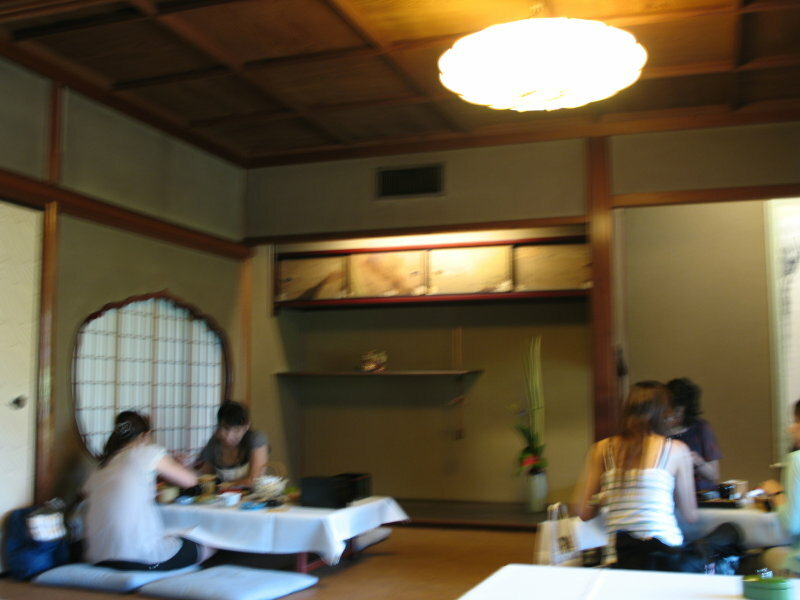 At lunch, the restaurant serves an informal, less elaborate version in shared rooms. (A bit blurry, alas.) Inside Minokō, dark, wooden hallways lead to tatami mat rooms like this one, all very traditional, except for the table cloths and central air conditioning. For dinner, you get a private room. 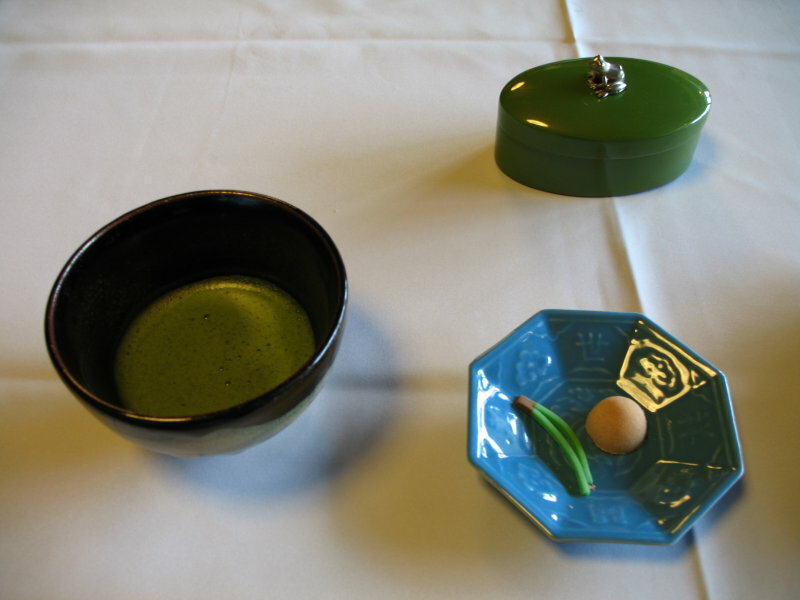 The meal began with matcha tea and some sweets. The green container held toothpicks. I suppose I should have moved it out of the shot, but oh well. 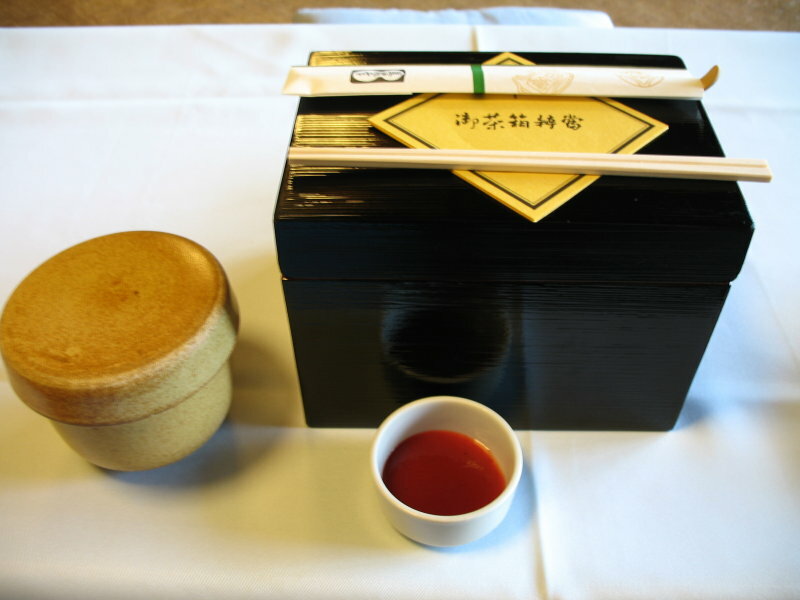 After tea, lunch was brought out in a chabako, a lacquer box meant for taking tea implements to picnics. 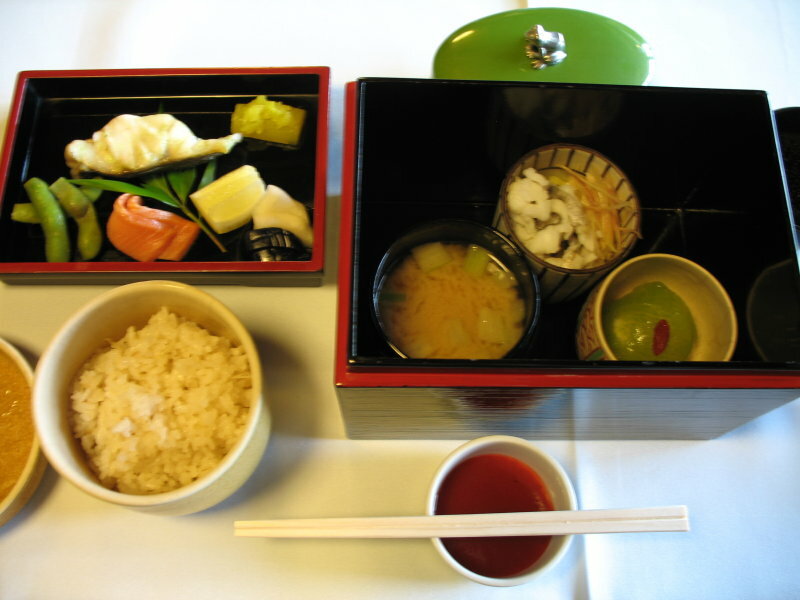 The jar on the left held rice and the red stuff was a dipping sauce made from pickled Japanese plums. Inside the box were two layers. I won’t list everything in the box – I don’t even know what some of it was – but here’s a better look at the three cups from the bottom. 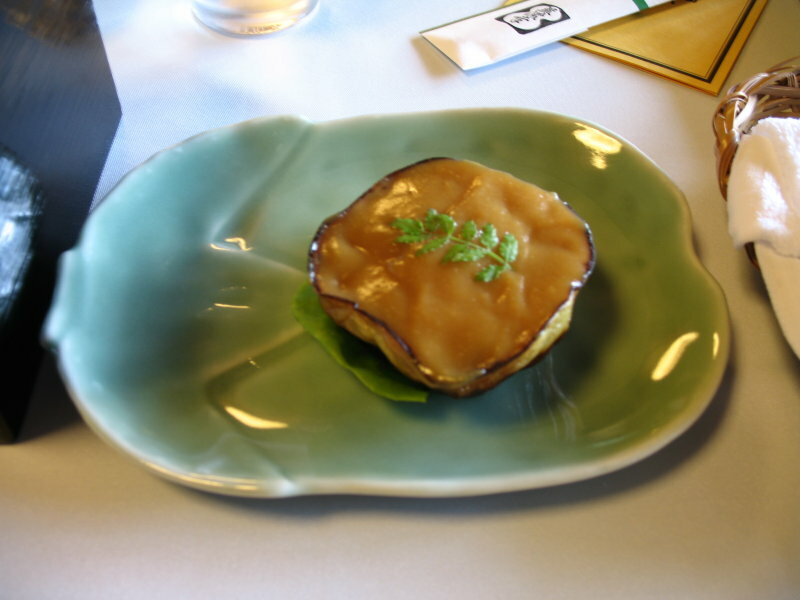 In addition to the box, they also brought out a plate of grilled eggplant with a miso-based sauce. 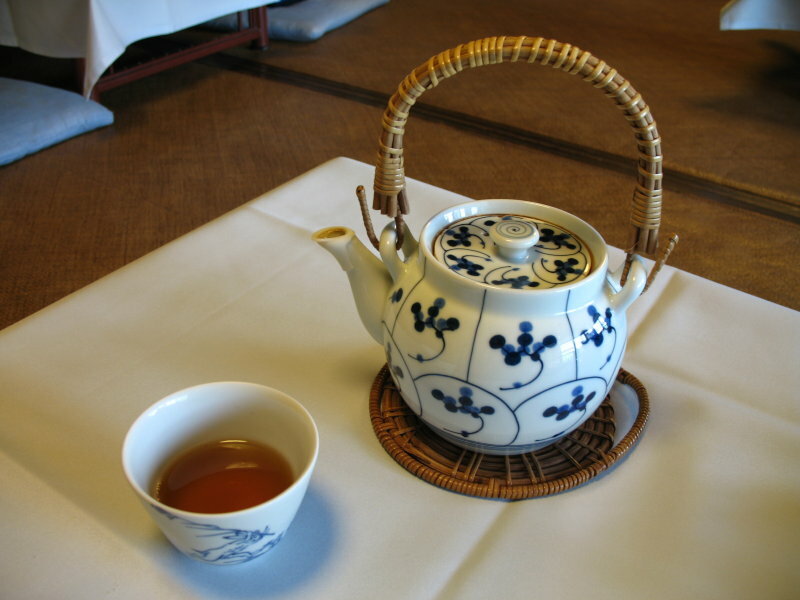 And of course, no traditional Japanese meal is complete without more tea. In this case, hōjicha, roasted green tea. 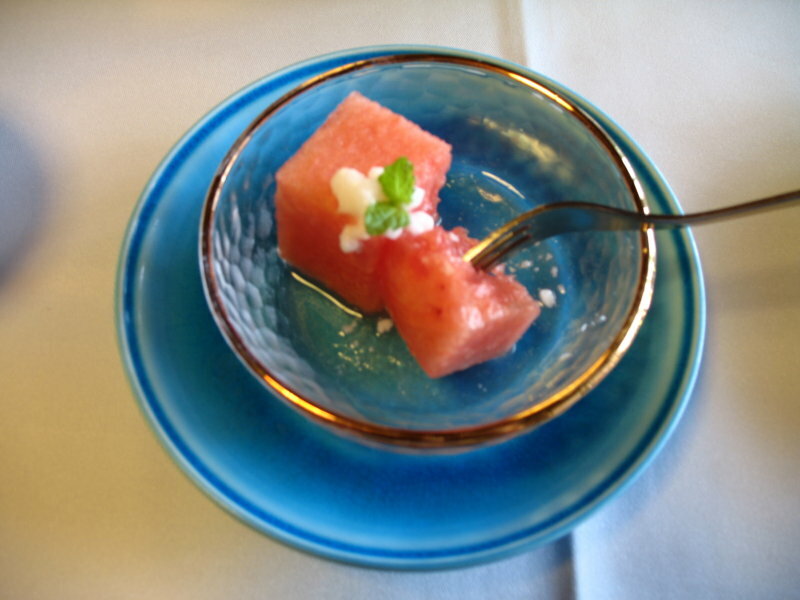 Finally, a small, simple dessert of watermelon ended the meal. 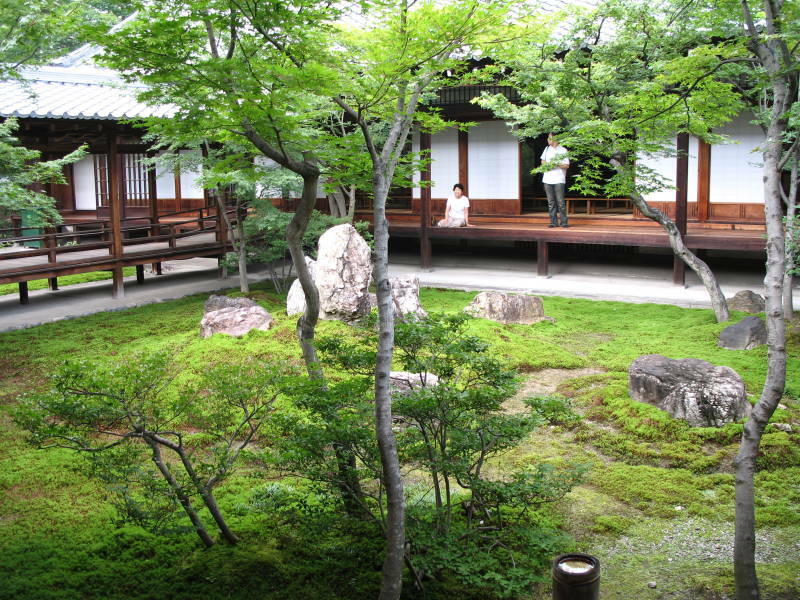 After lunch, I walked to nearby Kennin-ji, Kyoto’s first Zen temple, established in 1202. 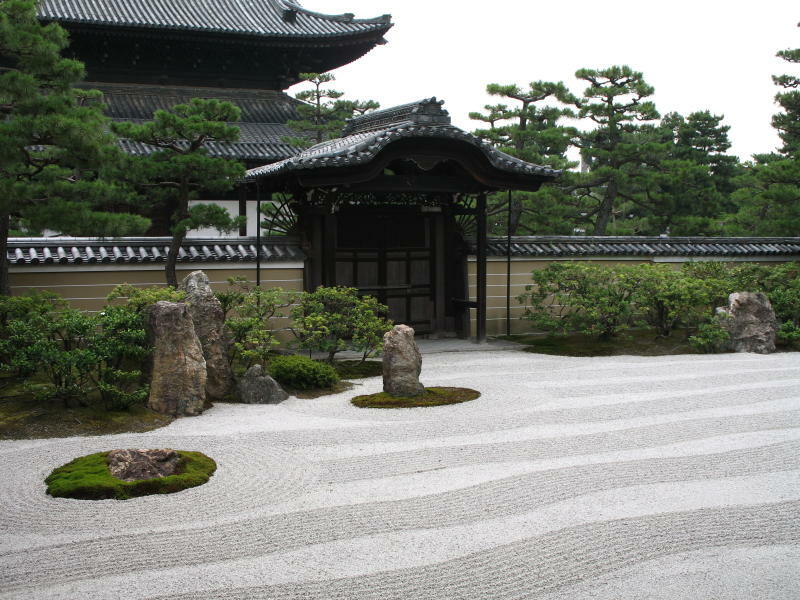 Like any proper Zen temple, it has rock gardens . . .
. . . and green gardens. The temple also had some notable art. 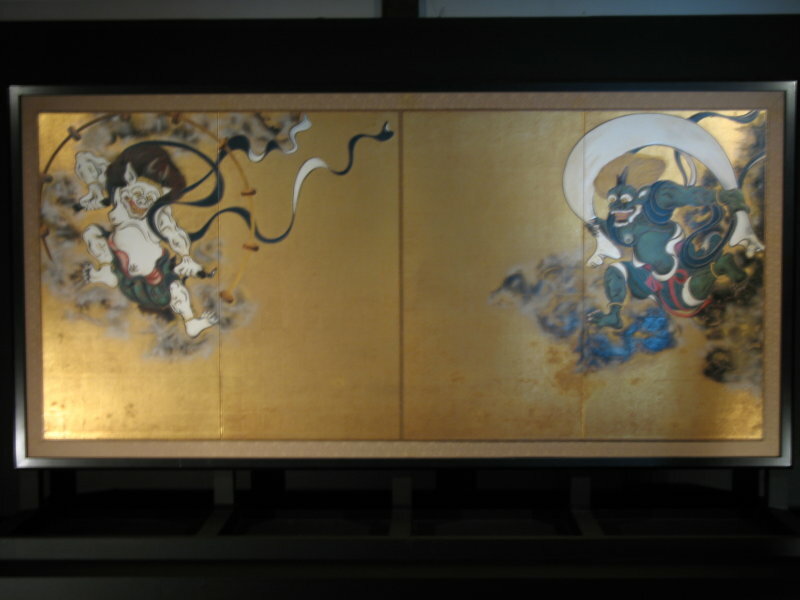 This is a replica of a 400-year-old screen painting of wind and lightning gods. The original is a designated national treasure and is now held at Kyoto National Museum. 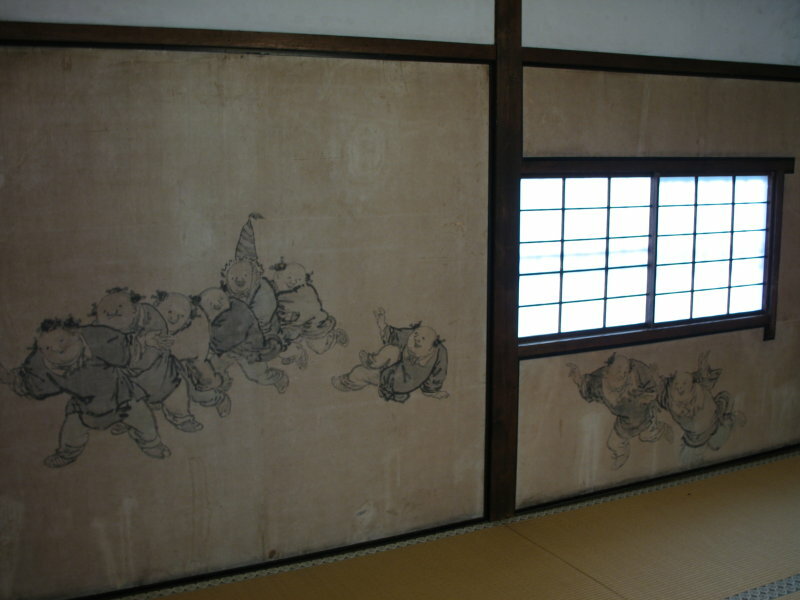 Old ink paintings decorated some of the walls. 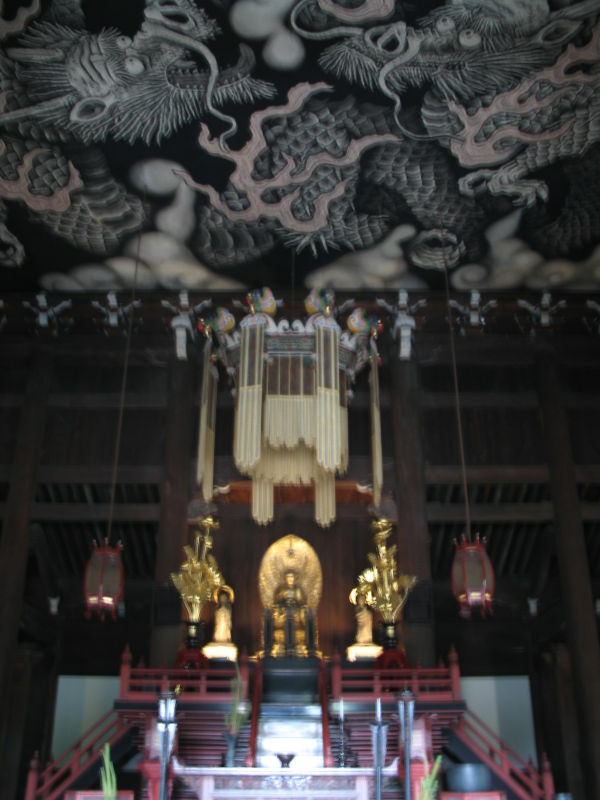 And a brand new painting covers the ceiling of the Dharma Hall. It was created to celebrate the temple’s 800th anniversary. After my temple detour, I got back to checking out places mentioned in Old Kyoto. 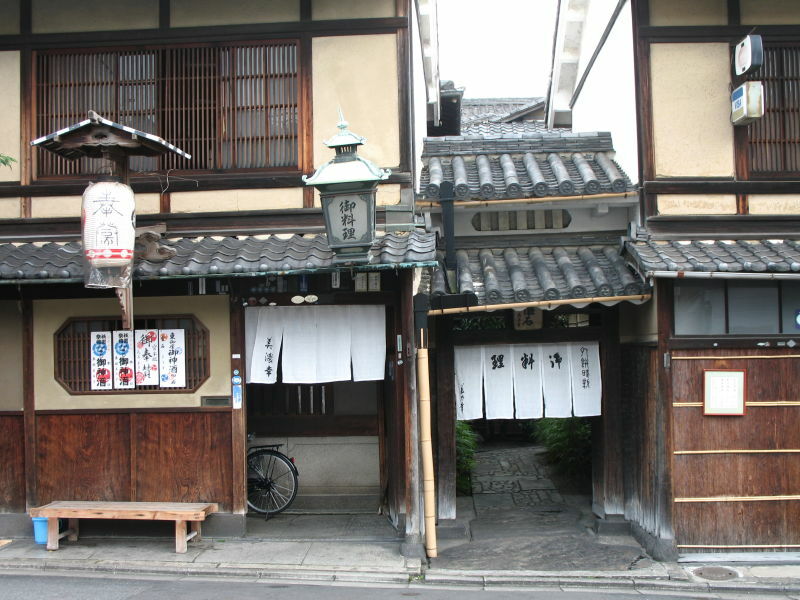 One was Aritsugu, a kitchen knife shop that’s been in business since 1560. I didn’t take any pictures, but their knives are all hand-forged, and were clearly of outstanding quality. A couple of professional chefs were talking business as the knives they had bought were sharpened and polished one more time before being boxed up. 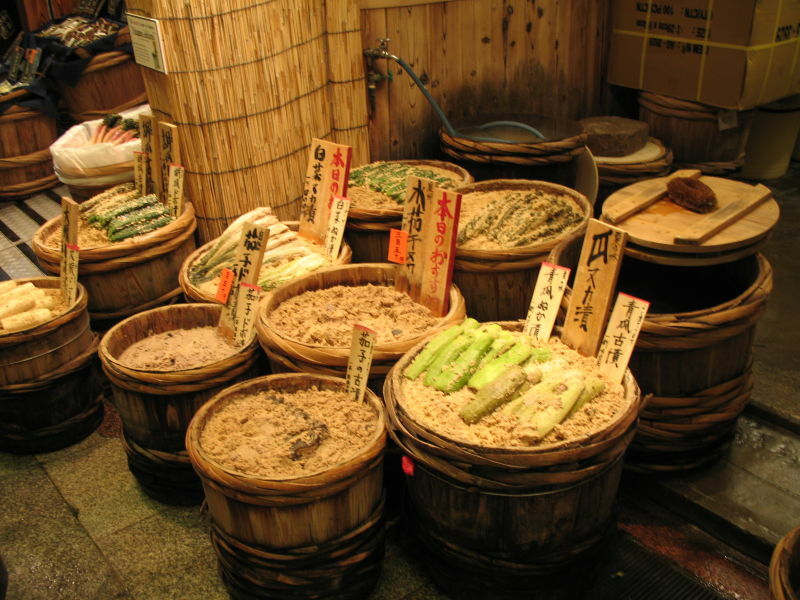 Aritsugu is on the Nishiki market street, which is known as “Kyoto’s Kitchen” and is an experience in itself. Many shops on Nishiki take pains to do things the old-fashioned way. Here, for example, is an assortment of pickled vegetables displayed in the handsome, traditional pickling tubs used to make them. The brown stuff is rice bran, the pickling agent in this case. After wandering around Nishiki I headed to the main store of Ippodo, a tea shop that has been around since 1717. Ippodo was an official purveyor to the Imperial Household, and although such designations ended after World War II, the company hasn’t lost its reputation. I bought a can of tea leaves, and while I was there, I ducked into the shop’s cafe/tasting room and tried some “koicha,” thick matcha. It was indeed thick. Really, really thick. After drinking it, you add more water and make regular matcha just using the tea left coating the cup. Crazy stuff. Before heading back to Kobe, I grabbed dinner at Matsuno, an eel restaurant a few doors down from the Minami-za theater. Good eel restaurants can be pretty expensive, so I ordered something simple. 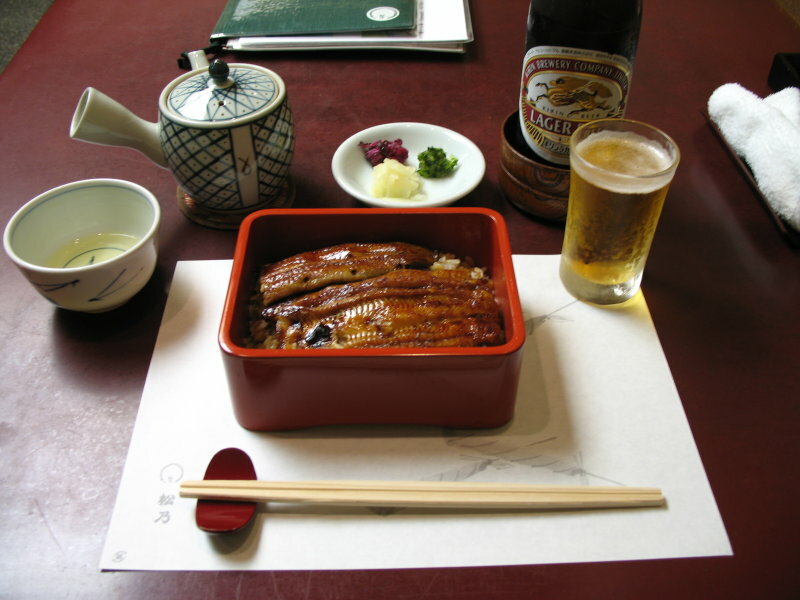 Grilled eel over rice, with green tea, pickles, and beer. Just this was thirty dollars, not counting the beer, but it was very good, and surprisingly filling. That’s all for now. Next week is the last week of class, and the following week I’m using the last of my paid leave to clear out my apartment. I’m glad I paid attention to my vacation days. Some poor suckers will be stuck at school with absolutely nothing to do. If I can get packing and cleaning done quickly, I think I’ll make one more visit to Kyoto, but if this one was my last, I guess I did alright. You are currently browsing the Erratic Dispatches blog archives for July, 2008.